Sbrisolona. 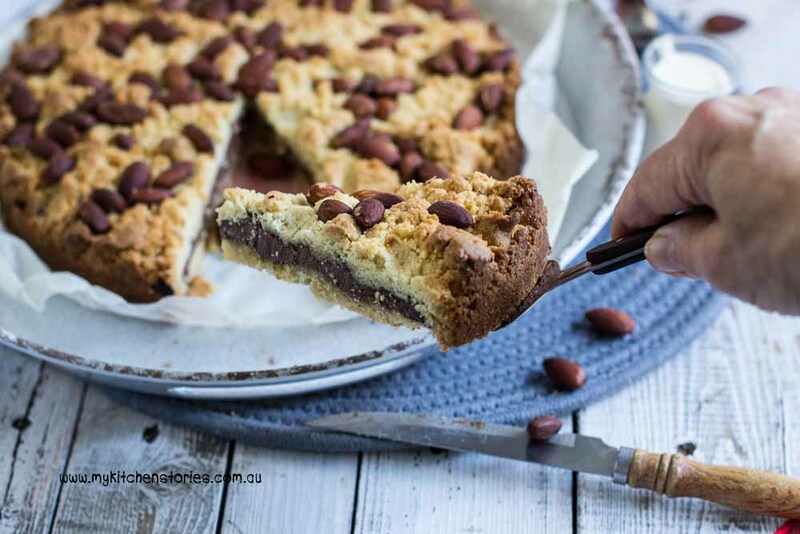 Almond Nutella Crumble cake is really like a crunchy tart. It’s also known as Sbrisolina a treat from Lombardy in Italy. Easy to make and SO delicious. Don’t forget to watch the video……. I always have so many things I want to cook at Christmas and yet not many of them ever come to light. That is because I just run out of time. I am good though at thinking up all kinds of quick and easy last minute substitutes that anyone could whip up. Things like this no churn ice cream Christmas cake or these ridiculously easy Fruit Mince Muffins . Then there is the Last Minute Christmas Pudding or this No commitment Christmas Slice just to name a few. Yes it is clear that I always run out of time. I do have a bit of an obsession with sweet things. Oops. This Sbrisolona is one of those easy things. I have made quite a few of these in the last two weeks. They whip up in the food processor in minutes and it seems that everyone loves them. My favourite is this one with Nutella, but I have made it recently with Jam and a layer of ricotta and also with fruit mince ( the sweet spicy Christmas kind made from dried fruit). You could say that this is extremely versatile as well as easy to make. Give it a try. Make it and keep it in the fridge for up to a week. Start by roasting the Almonds. Put them onto a tray and roast for 8 minutes or till just starting to colour. Cool. Put half the mixture into the bottom of the springform tin and press down. Add the nutella and spread over the base with a spoon or pallet knife leaving a border around the outside edge ( this stops the chocolate from burning). 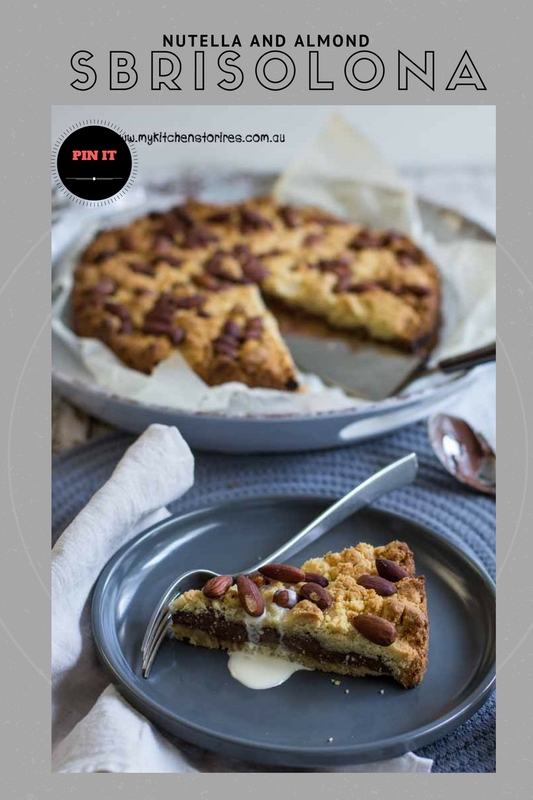 Sprinkle the remaining topping over the chocolate mixture and add the almonds to the top, pressing down lightly. 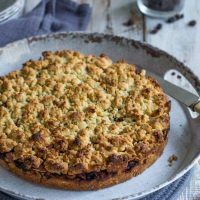 The Sbrisolona keeps better in the refrigerator overnight so it crisps up the buttery crumble, before serving. You can also store in the fridge for up to a week. Cut into small pieces. This cake should serve at least 12 people. 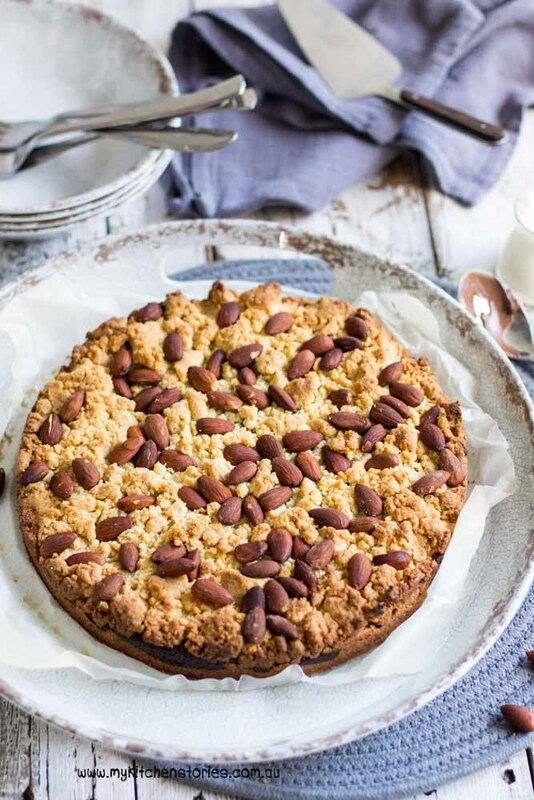 Absolutely delicious- light, crunchy, nutty & chocolatey…! Can we have Christmas all year round??? What an incredible cake (or tart). I relate to not making all the things I’d like to too! Hi Kari. Those Italians know how to tempt us! Lorraine @ Not Quite Nigella recently posted..It’s a Sausage Party, Finding Sydney’s Best Hot Dogs! 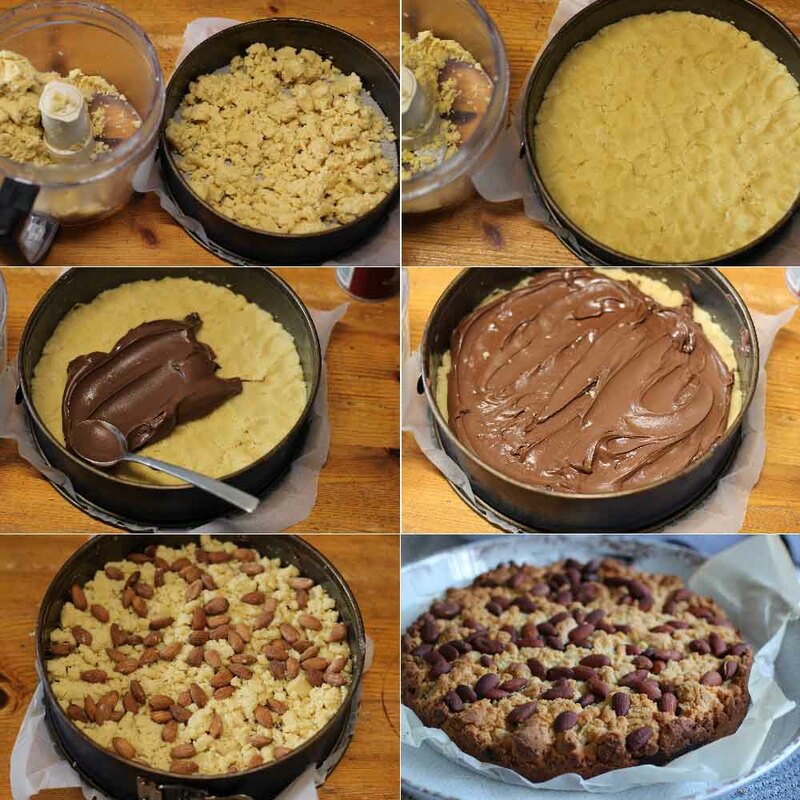 Almonds, Nutella, and a crumble. 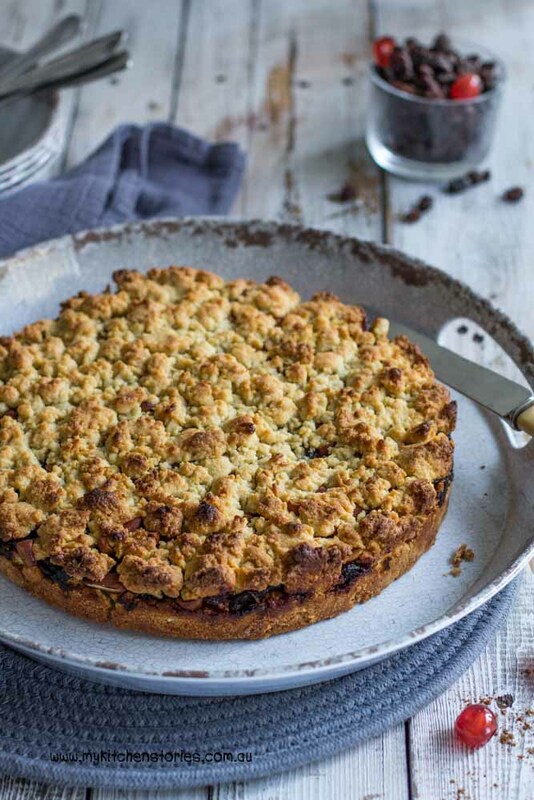 All of the major food groups in one tart. Amazing! Love that the recipe is versatile and that you’ve made them with jam & ricotta. Sounds delicious, Tania, with a great video, too! Now this is my kind of recipe – so quick and it looks delicious! It’s going on my list.